I have a confession to make: in the past I did not know much about post-war US armor. (I hope my sins can be forgiven.) I thought it was all Pattons, and they did not look particularly interesting, and the designations were confusing. Little did I know. The number of experimental, light, medium and heavy tanks produced before, during and after the war by the US is a largely untapped source of amazing-looking models. World of Tanks has helped to popularize these vehicles, which, I suspect, is the reason for recent plastic releases of the M6 and T54E1 (I know they are not perfect, but they are steps in the right direction). Most of these tanks are still only available by small resin manufacturers working in Braille scale, if available at all. Once I’ve realized that the T29 actually exists, and thatCromwell Models is producing a model of it, I had to get one… Considering the size of the tank I’d probably not buy a 1/35th scale offering even if there was one available apart from a really expensive resin version. The T29 project was started in response to the appearance of the German heavy tank, the Tiger II. US planners wanted something that could be used against these gigantic, heavily armored and armed tanks, as nobody knew back then exactly how big of a threat they’d pose once the US engaged the German armed forces in the Continent. As it turned out not much, since they were never produced in sufficient numbers. The T29 was based on the T26E3: the hull was lengthened; it was given a thicker armor (279mm at the thickest points), an upgraded engine, and a new turret with a 105mm main gun. The turret featured a very prominent coincidence rangefinder, which protrudes from both sides, giving the tank a very unique look. The weight of the new tank was 60 tons. After the war ended, the T29 (and its brother the T30) development and production was put on hold, and it never entered regular service. Even though the tank was not really a successful design, it wins in my opinion just based on looks alone: it is one of the best looking tanks ever made. 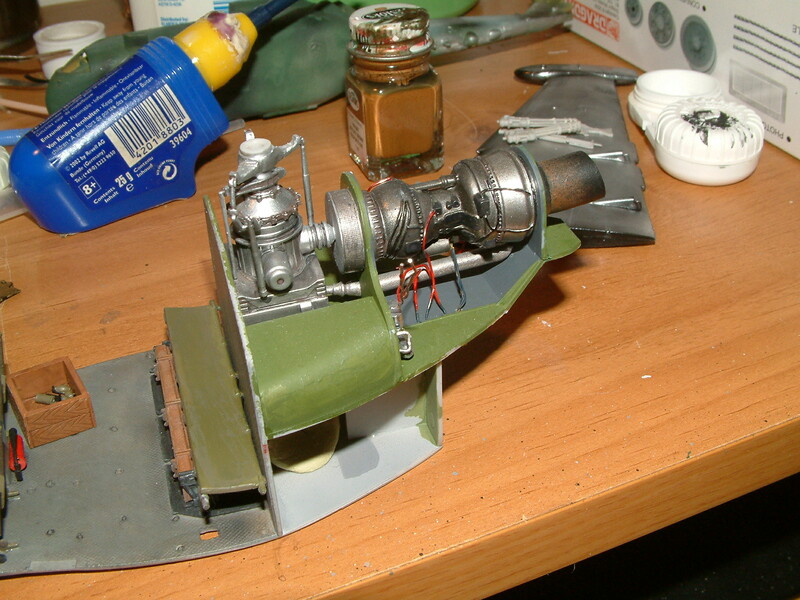 The model does not come with instructions, which makes the identification of most of the smaller bits quite difficult. (I admit since I don’t have proper references -books-, I have given up after a while. 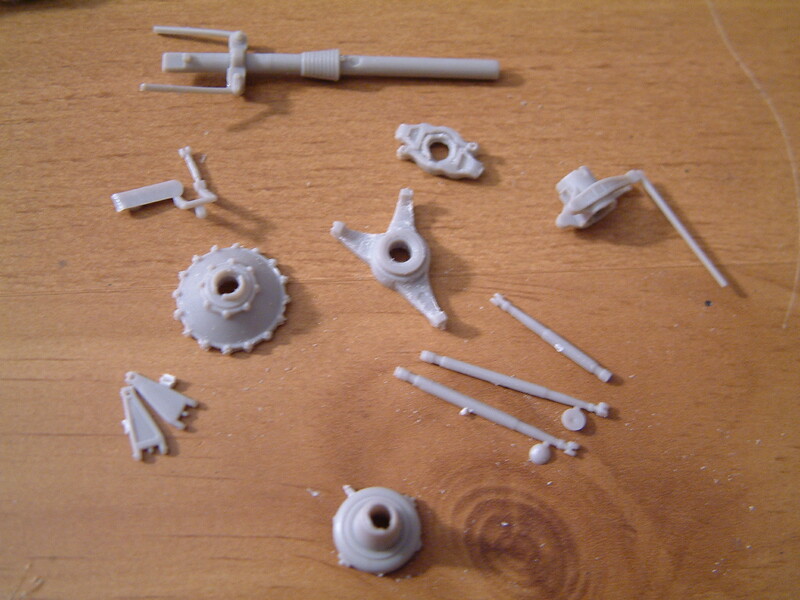 I looked up walk around photos and as a last resort I used World of Tanks, but I still have a lot of parts left over I could not place. 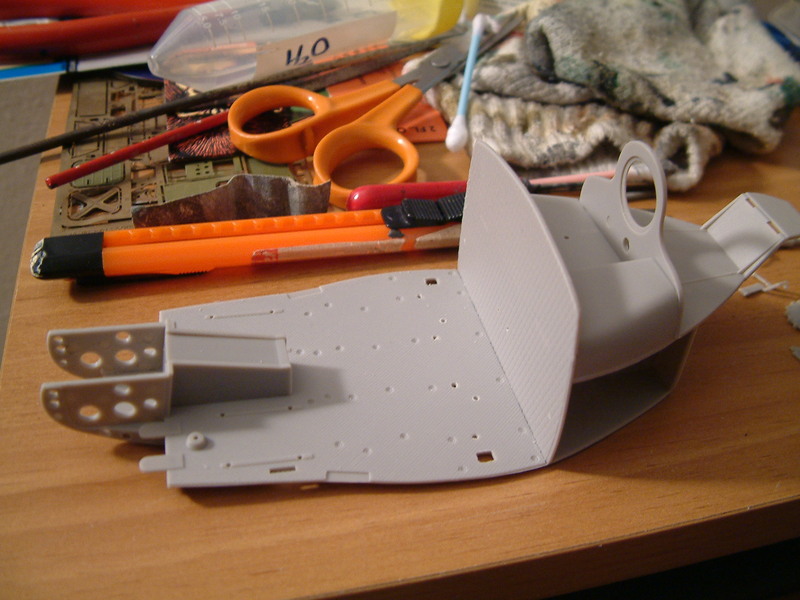 As mentioned the hull comes as one piece, with the suspension and the tracks already mounted. 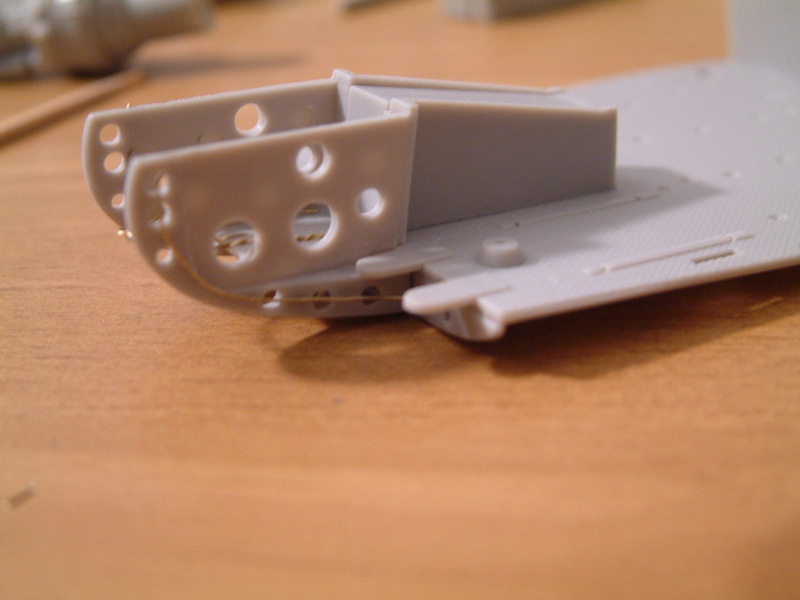 The tracks are very delicate, and really detailed; be sure not to break the extremely thin cleats handling the model. There is some clean-up necessary under the tracks, between the road wheels, as the complex mould means there will be imperfections in the hidden areas. I’m not even sure how you can prepare so complex assemblies in one piece. You also get a lot of spare track sections; should you break one or two of those cleats, you can always replace them using the extras. 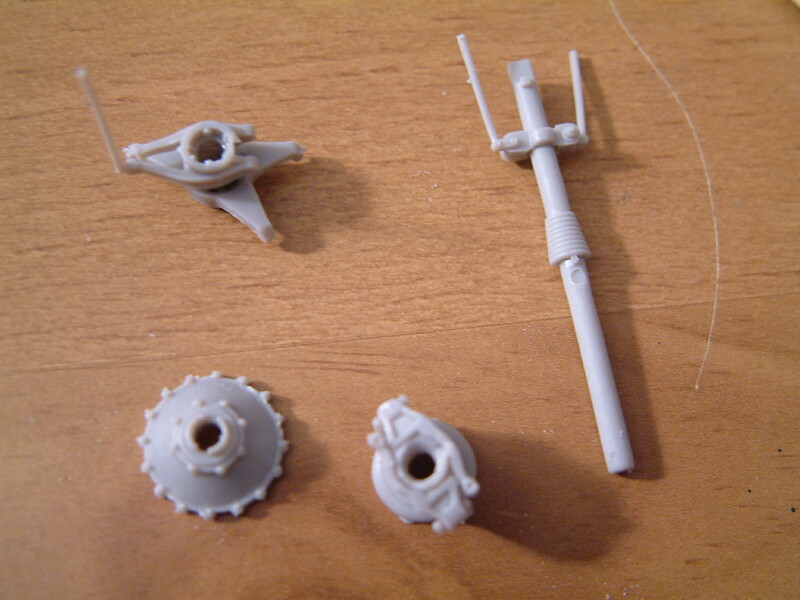 I’ve managed to break some as I handled the model. I did leave them like that when I took the photos of the finished kit but I’ll fix them up later before the model is placed into a display box. The model looks accurate, and measures up against the dimensions I have found online (this is where proper references would be indispensable). 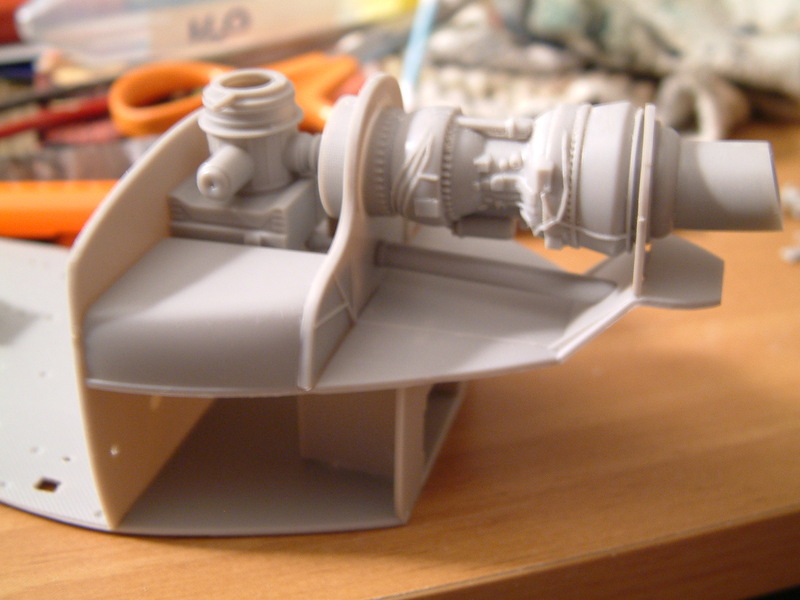 It also measured it up to a 1/72 scaled picture printed out from Blueprints.com very well. In short the basic size and proportions seem to be fine. The building is simple; after gluing the main parts together, you add the small bits (that you can identify), and you’re done. The fit is perfect, so I did not have to perform major surgeries. 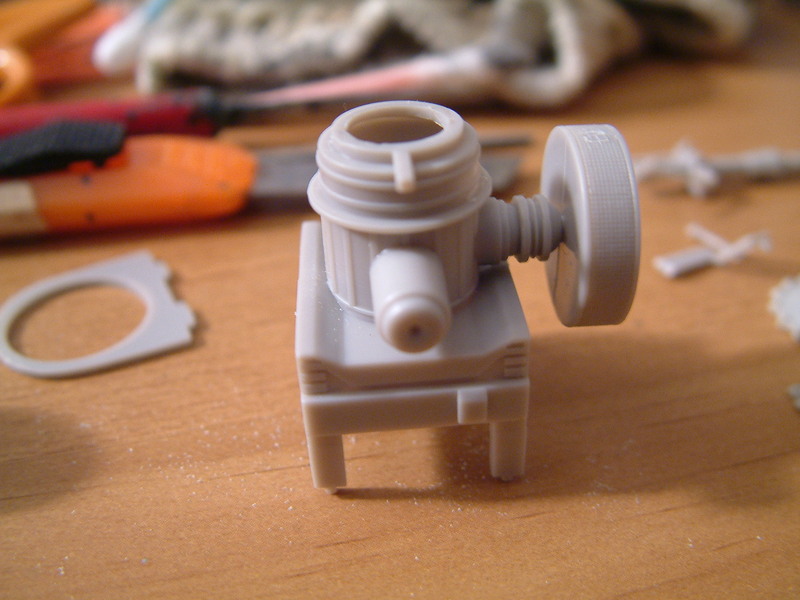 I decided to glue the turret in place almost in the beginning, as it is a heavy piece of resin, and managed to drop it a couple of times. 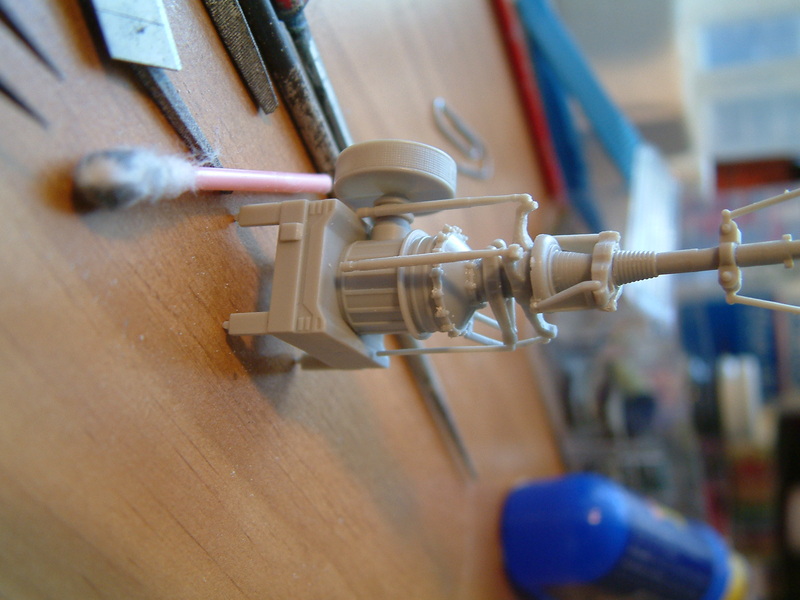 (The blue tac I used to fix it onto a paint jar kept giving way…) This is when the commander’s periscope broke in half; this was the point when I gave up and just glued the damned thing into place. All the hatches can be positioned open, but since there is nothing underneath, I elected to close them. (It would be too much to ask for an interior in this scale. But it would be awesome nevertheless.) I’ve suffered another minor accident during the build, and one of the covers of the rangefinder optics has disappeared; this is somewhat embarrassing in a review… the carpet monster has gotten its due in sacrifice. When you look at the reference photos available online from the Patton Museum, the tank looks brown and faded from standing in the open for decades; however I wanted to show a newer tank that has been in heavy use in the field. So now we have a green tank with nice tonal variation on its different parts. To make it more brownish, the color was modulated using a brown filter- and now the tank looks a faded olive drab color. The kit does not come with decals (as usual with resin kits), and lacking US decals/dry transfers I left the tank unmarked. I added chips using a sponge and dark brown paint, and pin washes using burned umber oil paint. 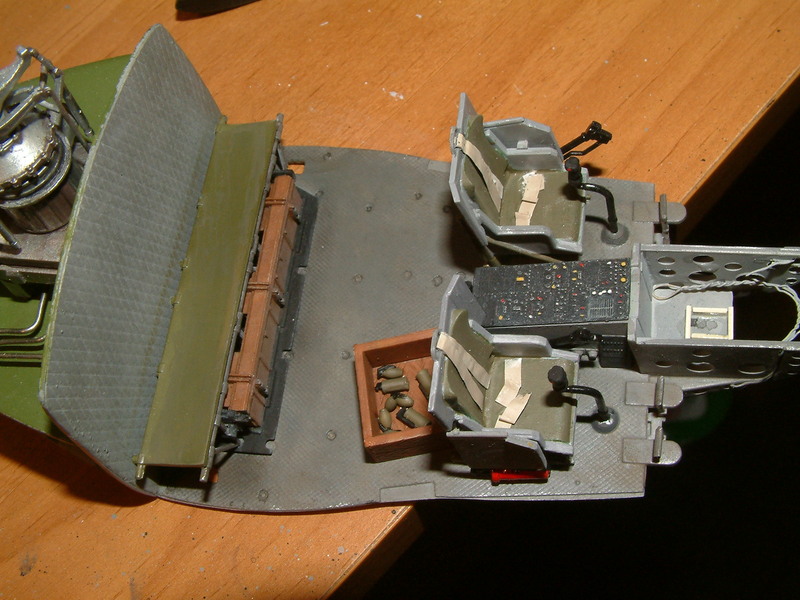 I applied a black wash to the engine deck grilles to give them depth. The mufflers were painted using different rust colors and a sponge over a black base. 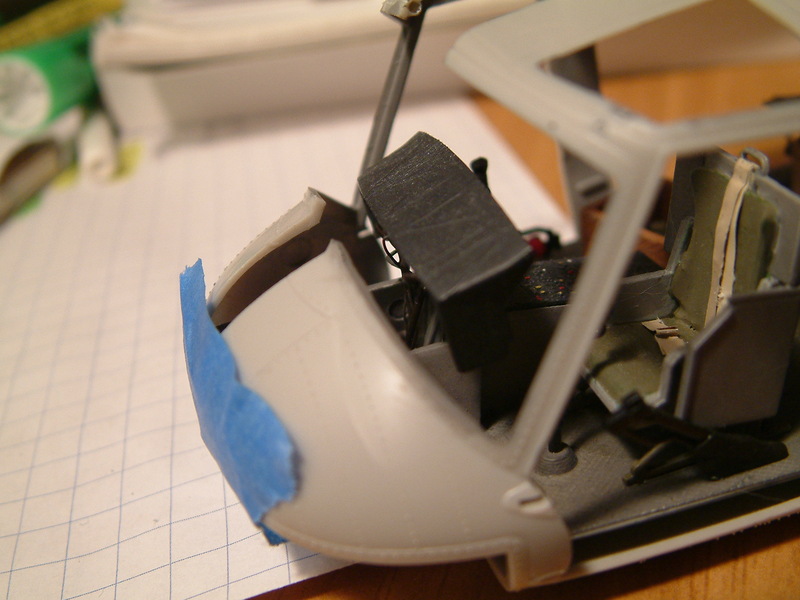 The lower part of the chassis was treated with different shades of earth colored pigments using white spirit. Once they dried, I used a brush dampened with white spirit to remove some of the pigments. As a final I added some dust on the top part of the turret as well using Tamiya’s “make-up” set, and I used a graphite pencil to rub around the edges and the tracks to give the model a metallic shine. I was always fascinated by the Huey. It is the symbol of the US involvement in Vietnam, and of every horrible thing that came out of that conflict. Even the last event of the war -the fall of Saigon- is associated with the evacuation of the US Embassy using the Huey. 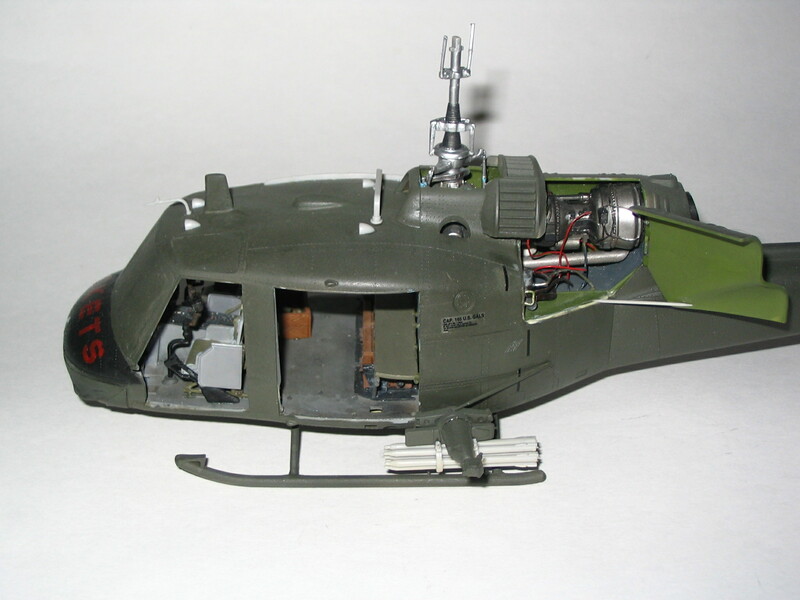 The UH-1 was the first real combat helicopter, and it made insertion -and evacuation- of troops much faster; it made fire-support easier, and it lead to the development of the first dedicated combat helicopter, the AH-1. Its variants are still used widely all over the globe; all in all, it has proven to be a singularly successful design. In other words: it’s a legendary vehicle in both the good and the bad meaning of the word. I used to have an English teacher back home, who happened to be a Vietnam veteran; he was one of those guys who was dropped in jungles with these helicopters, carrying a radio and an M16. He did not really discuss his experiences in the war. He was (and is) a very good-humoured person; I think if you survive the horrors of war, you can either break, or be happy and grateful for every single day you get from life. 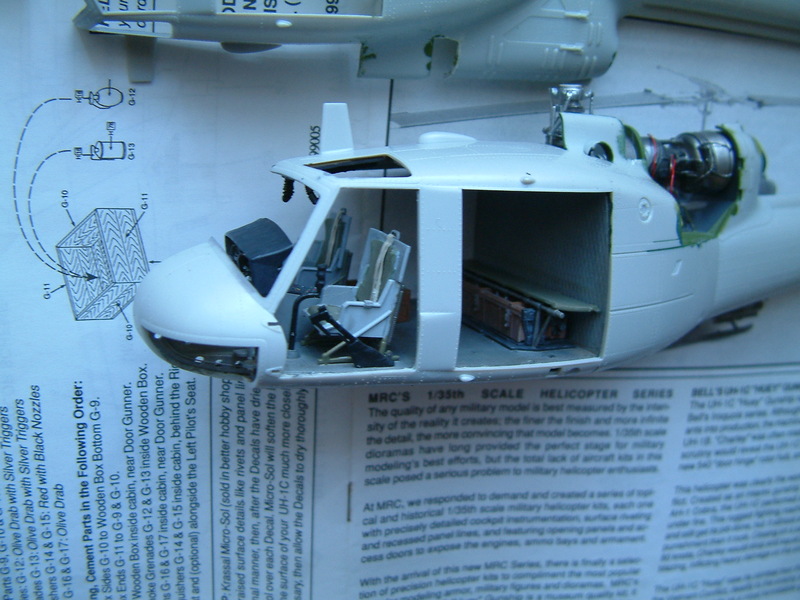 The build, in general, went together quite well, although there was a gigantic fit issue with the fuselage; somehow the two halves just did not join up… A big problem, MRC. It took me a lot of time to fill up the gaps. The first steps of building the interior. So far, so good. The finished rotor looks really good; it is a very nice representation of the real thing. 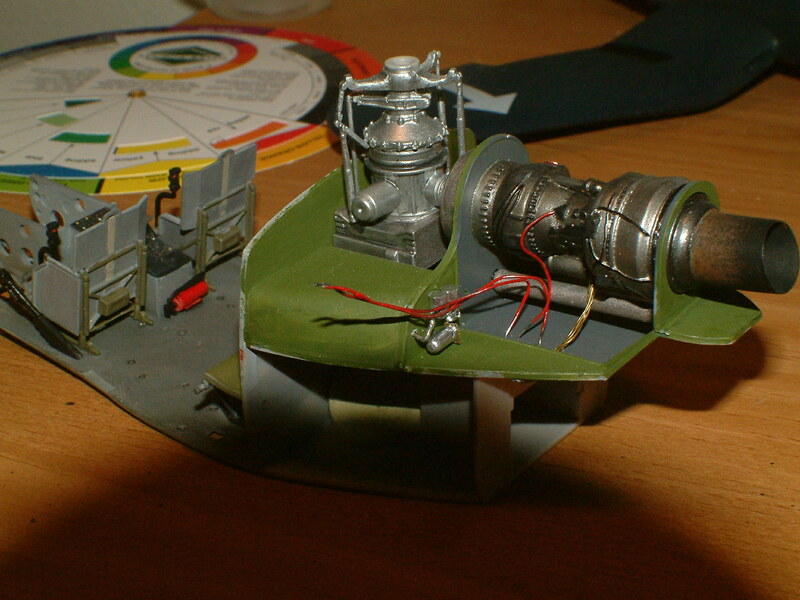 The engine looks great; I’ve added some thin wiring for extra detail. Because the exhaust is corroded and darkened by the fumes, I started with a black base, and dry-brushed some brown on top. 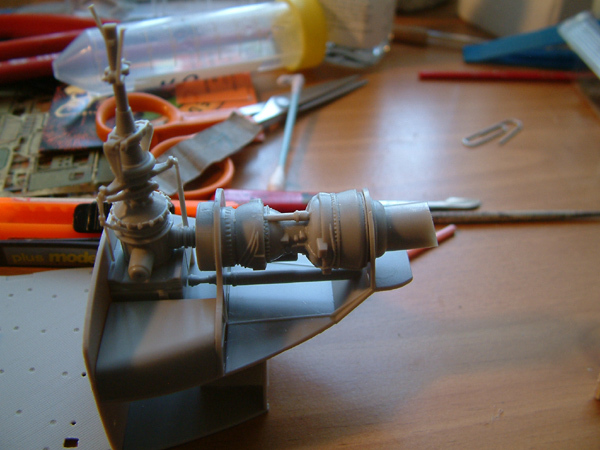 Work on the engine compartment; because it looked a bit empty, I added some extra cables. Thins are falling together. The straps for the seats were made from aluminium foil. The painted instrument panel. 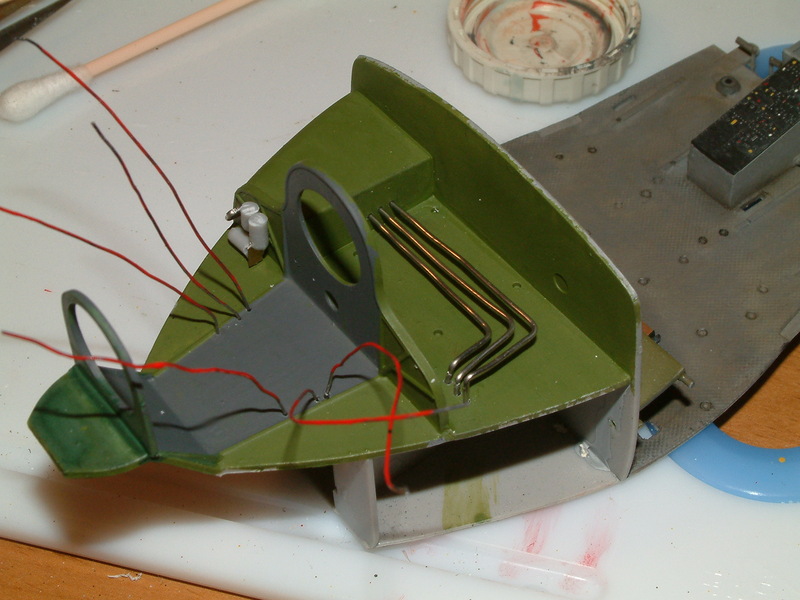 I have to say, there’s a lot going on for pre-painted PE instrument panels. Finished interior looks pretty good to me, even without PE or other aftermarket parts. The box of grenades stroke me as a strange addition to the model; I’d expect a wooden box laying around unsecured would end up sliding out into the big empty. Finished engine bay. At this point I was seriously pleased with myself -until the next step, that is. Nope. It does not fit. It does not fit at all. Masking and painting. 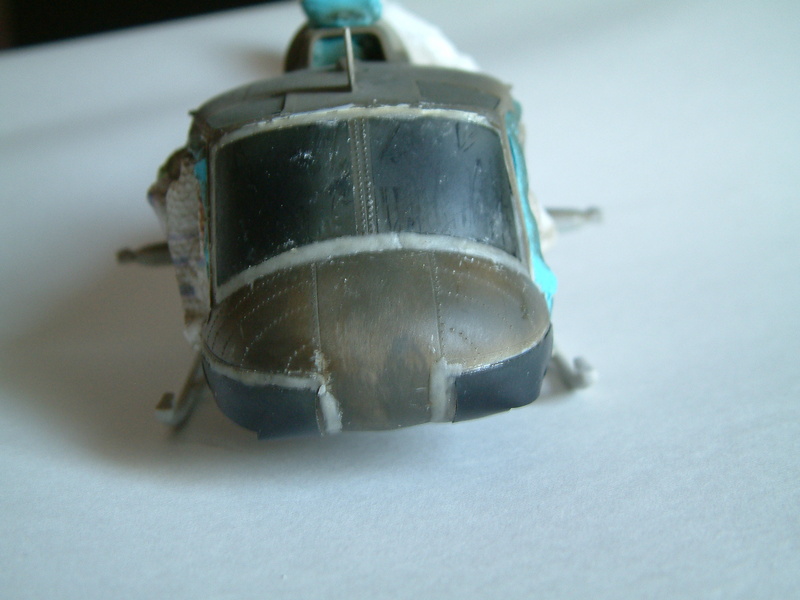 There was a serious case of filling everything up with two-part epoxy – the stress on the fuselage halves is so big, I needed to have the filler itself is acting as an adhesive. I don’t think plastic glue alone would have been sufficient. 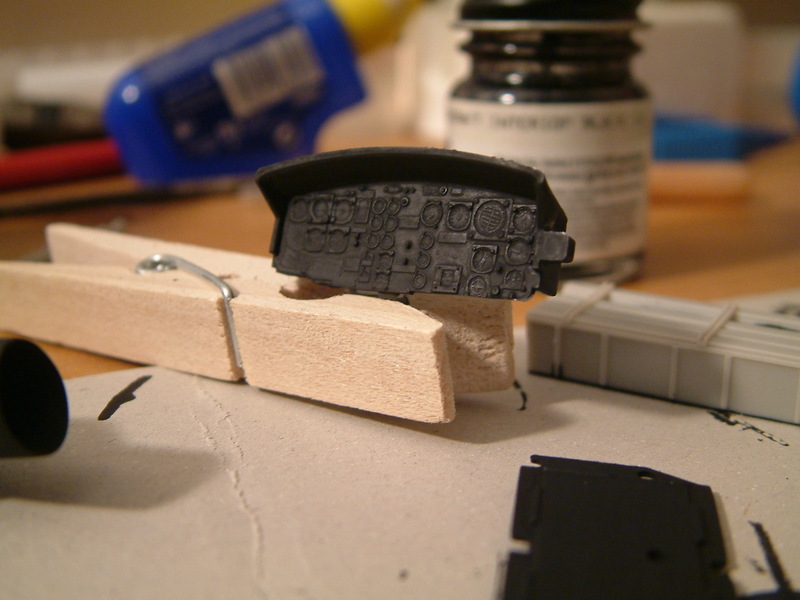 It made sanding around the windscreen pretty hazardous, though, and unfortunately some fine details (rivets, panel lines) fell victim of the process. The finished model -well, almost finished. Some details were needed to be painted (I don’t have any more photos left, unfortunately…) As soon as I find some, I’ll update the post. 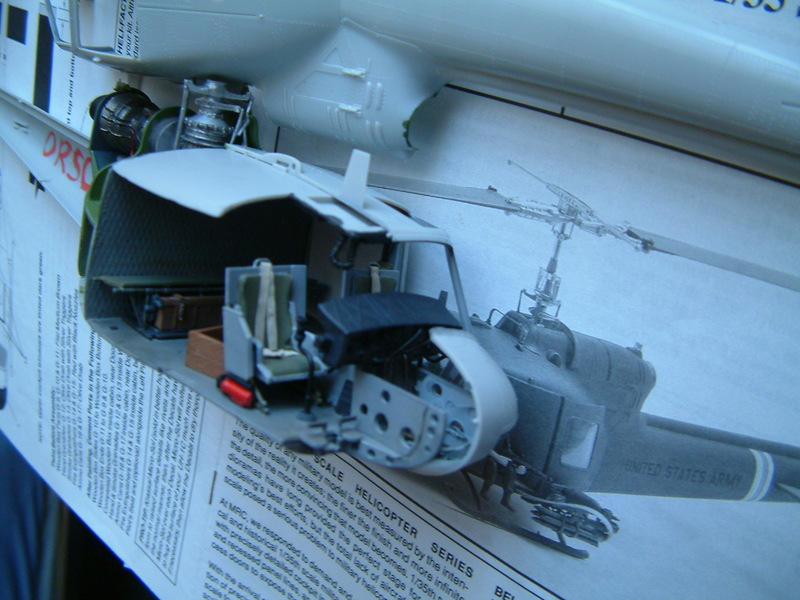 This is the third part of the review of the Miniart D7 Dozer. The tracks received a black primer coat first, and then were painted in a dark grey color. The metallic sheen came from dark metallic pigments rubbed on them; the parts that are normally subjected to higher wear and tear, therefore are usually highly polished, received some silver pigments. Once they were mounted onto the suspension I added a heavy brown wash, and once it was dry I added some dust, using brown pigments suspended in water, and some more silver pigments. IT LOOKS LIKE A D7 NOW!! 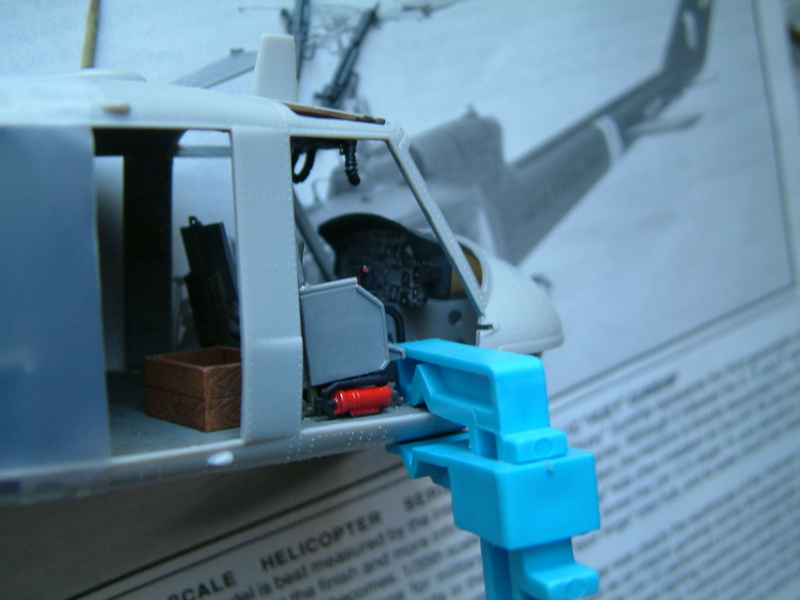 This is part two of the MiniArt D7 review. The suspension is a very complicated, very detailed assembly. 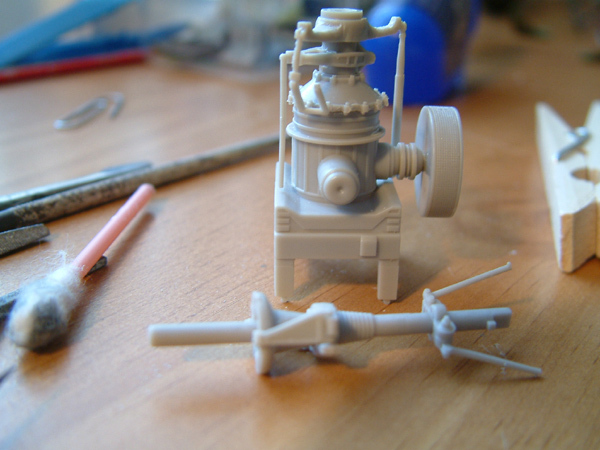 Miniart has managed to even mould a set of springs… an actual plastic representation of springs, which look exactly like the real thing. They are very delicate, and easy to break (while you are trying to remove moulding seams), and also will be covered by the metal plates protecting the suspension, unfortunately. Nevertheless I have to say, it is an impressive feat of plastic moulding technology. That plastic spring still makes me wonder how they did it. The assembly here -considering none of it will remain visible- seems overly detailed. The wheels and return rollers are composed of mulitple parts (step 51, 57 for example); I’m sure these could have been designed to consist of no more than two parts each. Most of the suspension elements could have been simplified as well, as they will be hidden once assembled. The only reason they are designed to resemble the real thing is that you might wish to depict the suspension during maintenance (I’ve seen a photo with the covers removed) or with damage. I was tempted to do a “cutaway” view on one side, but did not dare to endanger the review sample. Once the suspension and the tracks installed, the final hydraulics pipes will need to be glued on. The over-engineering can be seen here as well: the pipes (H8, 9, 10, 11) could have been moulded together with parts H12, 13, Db16 to simplify things. The dozer blade and its attachment unit is the very last step of the build. The blade itself and the frame looks gorgeous; you can see the subtle welding lines; the instructions, however, don’t show the alternative positioning optinos. 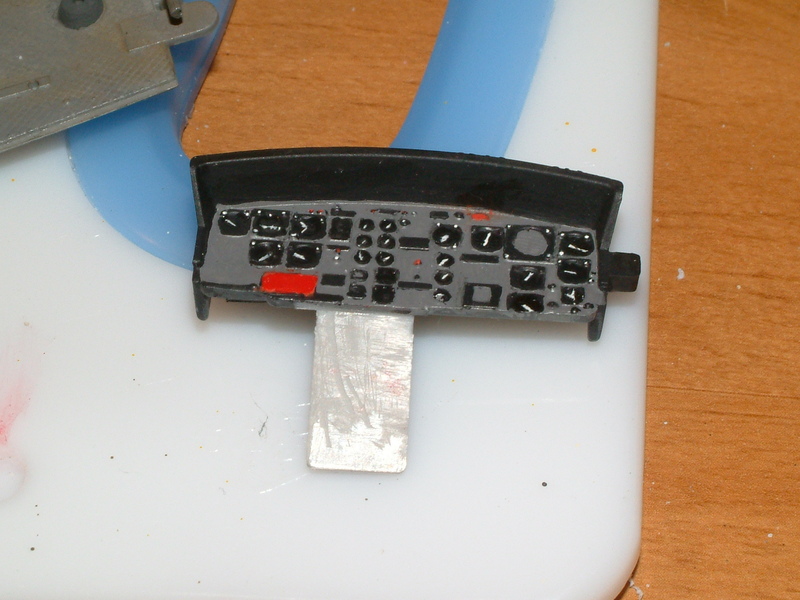 It goes together reasonably well, however you will need to do some filling on the blade itself. Part Db4 will snap if you put it on peg on Db9 in step 79, due to the smaller diameter of the hole on it; enlarge the hole slightly with a scalpel first. 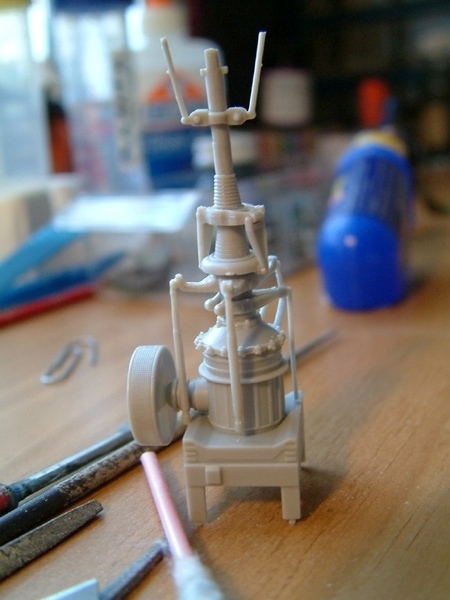 The model is slowly taking shape… time to paint. How many parts do a dozer make? 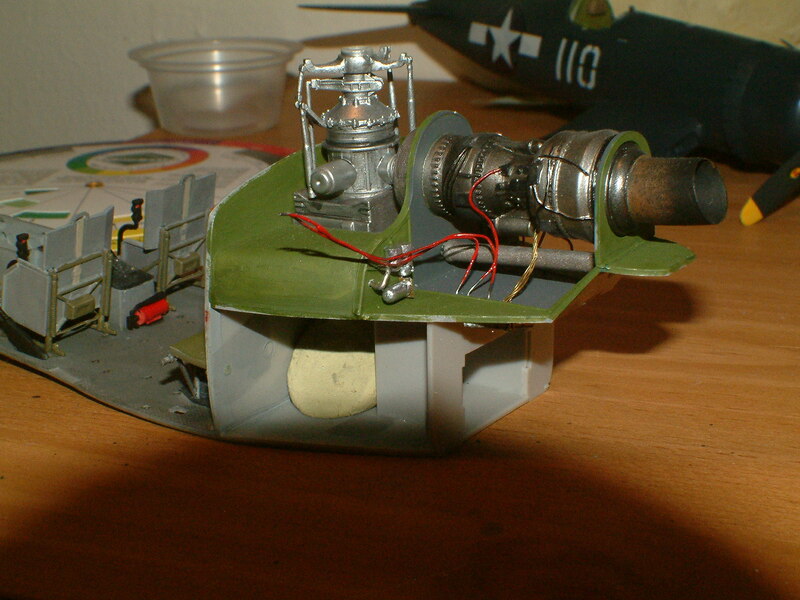 Fortunately most of the model is olive drab, engine included. 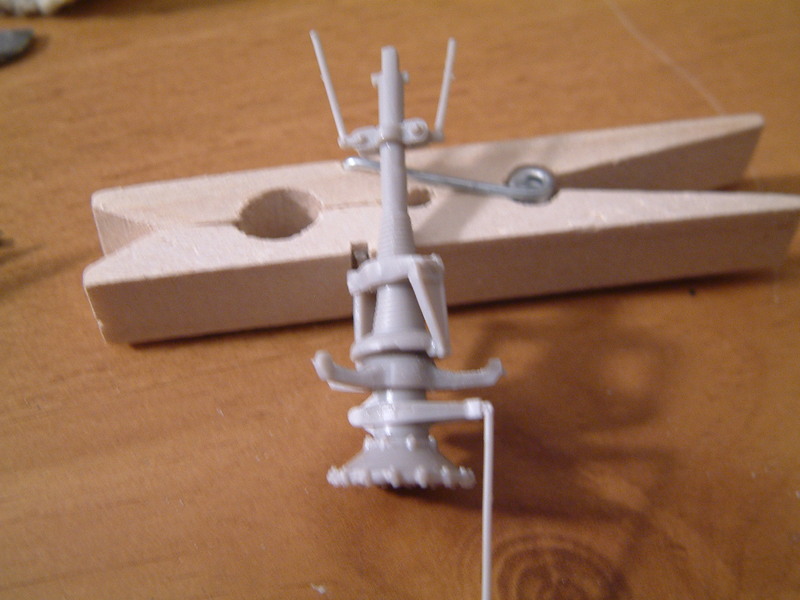 This simplifies the painting process, as the model needs to be painted while being built. I’ve chosen to display it with moderate amount of weathering and rusting; while I really find the rusty-worn-torn look appealing, tanks and tractors did not really rust that bad on the field. (It’s a combination of short lifetime, maintenance, and protective paint.) Dozers and tractors are somewhat exception to the rule, as they were generally not in the line of fire, but I still did not want to overdo the effect. (After spending a month building it day and night I was afraid I mess it up with overzealous weathering. I’m a coward.) The other reason I’ve gone for the relatively clean look, despite of photos available of the dozer being absolutely caked with mud and dust was that this would have hidden most of the model. The plastic has some interesting moulding imperfections. Don’t worry; these will be invisible under the final paint. I’ve done most of the painting and weathering on the larger subassemblies: armored cab, engine and chassis, the suspension, tracks, and the dozer blade; this, of course means I only saw how the vehicle looks like at the very end of the building process. It was an incredible feeling -suddenly I had something to show for after all the work. I’ve used Citadell’s Steel Legion Drab and Castellan Green to mix an olive drab color for the dozer. I always wanted to try the airbrush ready Citadell paints, and this looks as good time as any. Changing the ratio also allowed me to prepare lighter and darker colors. They are very thick, they did seem to be very good for airbrushing. I tried diluting them at first, because I could not see how this thick paint could get through the airbrush, they were perfect unthinned. Well, the first paint layer was done. It’s getting near to the finish.